On the one hand, the government is making drastic cuts which will lead to serious closures. At the same time, it wants the NHS to sell off 'surplus' land created by these cuts. Hospitals that don't sell land will be punished. Theresa May has been absolutely clear that she supports these plans. We need to stand up for our NHS NOW. Of course this is part of a bigger picture, which the NHS Roadshow explains brilliantly in this video. If you care about the NHS, don't vote Conservative. The Conservatives were the only party to score 0% on our 'People vs Politicians' scoresheet on public ownership policies - while 84% of us want our NHS in public ownership. This Thursday, don't let the Conservatives get away with robbing our children's future. Spread the word - it's time to vote for our NHS. this is disgraceful, refusing to stop NI rises and sell off the nhs what is national insurance for ? Chancellor Hammond tried to increase NI payments by increasing numbers paying in but Labour and SNP stopped it by saying Tories had in manifesto not to increase, - it was shooting us in the foot! Same happening with the first idea to address the exorbitant costs of care of chronic illness and allow people to,stay at home, - which cheaper for them than Nursing Home and because it Tories all other Parties slinging mud, .... but no idea of their own to deal with aged and chronic sick needs and keep in Community. 1 tory seated in Parliament is too many. Young people use your vote and make a difference. The Naylor report, which Mrs. May told Andrew Neil she supported, is a rip off merchant's charter. It will force the sale of NHS assets, buildings and land etc. which our taxes have paid for to private asset strippers. Such cheap, underhand tricks are exactly why Theresa May told the Tories they were the nasty party. Now she is proving it. PLEASE share this as widely as possible. This is more important than Brexit. Once the NHS is gone, we won't get it back. It is too precious to lose. 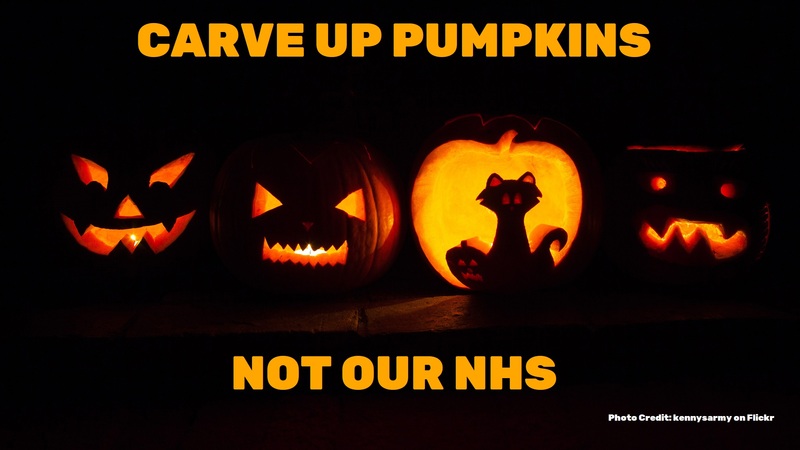 Don't let any Government sell NHS piece by piece, we will be sorry but it will be too late. Do what you have to do now in the ballot box June the 8th. 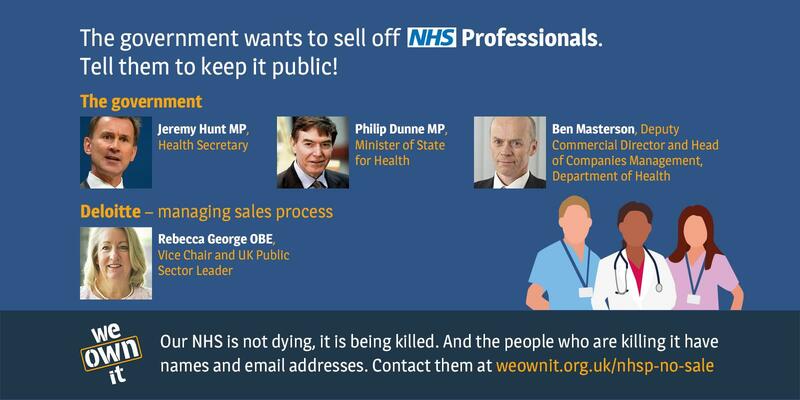 Keep our NHS in public ownership so that we and our children and grandchildren can use it. Don't let it be hived off which would rob future generations of so much. It would be a criminal act to sell it off - absolutely outrageous. Please don't let the Tories destroy our NHS, don't let them get away with this. Just as suspected, there is an undercover attempt to privatise the NHS for the benefit of private and foreign investors. Stop it and make your vote count for the many not the few! The only way to stop this underhand privatising of the NHS is to vote LABOUR on Thursday, even if it is raining don't stay at home! I have posted for a long time on this issue. Jeremy Hunt and Simon Stevens want the KAISER PERMANENTE insurance based model of healthcare currently used in the USA. Having lived in the USA i know what a catastrophe that would be. Less than a month ago i visited the Kaiser Permanente website and got a quote for healthcare. Based on an income of £26k pa it would cost $912 per month or £707. This was a top or the range package but there were so many exclusions, too many to list here. A vote for the conservatives is tantamount to signing your own death warrant. There are so many serious subjects such as the NHS , which of course to date most of us have used. So i 100% support all the big issues , however to do this permanently we must come together in the millions and CHANGE THE CURRENT TWO PARTY SYSTEM. To do this and getting fresh ideas , and change the way forward has to be PROPORTIONAL REPRESENTATION . Whether you be liberal, green, ukip or any other party for that matter WE NEED THOSE VOICES HEARD , but by changing the voting actually puts them into decision making places not just THE CURRENT MAKING THEIR VOICES HEARD. Just taking this subject again IT WOULD NOT EVEN MAKE A GREEN OR WHITE PAPER. However because of the current system THE TORIES ALONE INITIATE EVERYTHING. Lets just use the GREENS AS AN EXAMPLE , in terms of votes they polled 9% of total votes cast NUMBER OF MP,S NIL. Change the system you change politics. I have never trusted the Tories with OUR NHS. They are on their way to destroying the one thing the British people value above everything provided by the State. Hunt is a man I would never trust, he has proven to be the worst of Tory kind. If you want the NHS to be privatized then vote Tory on Thursday and you will be given your wish. I do not belong to any Political Party and although I have my doubts about Mr. Corbyn I will be voting Labour in the hope that the Tories can be stopped. The Tories hate the NHS. Always have and always will. They hate the sick, disabled and the poor. Anyone not rich is disposable. Vote Lab tomorrow and defend the NHS.